Some more upwards movement to 48.09 – 49.35 was expected. 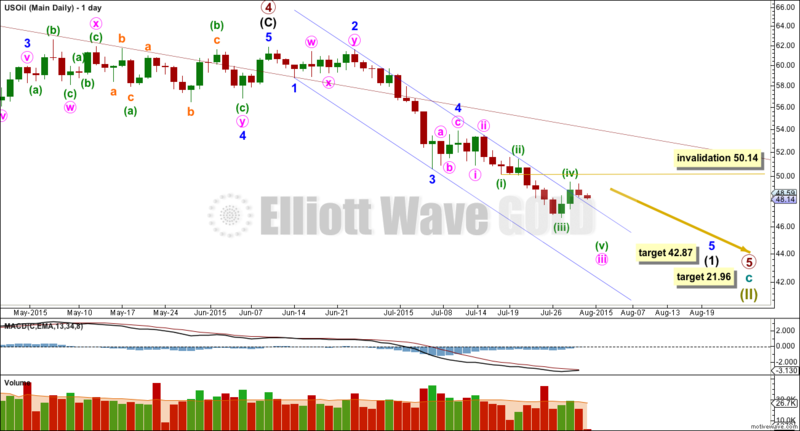 Thereafter, the main Elliott wave count expected price to turn back down. Price moved higher to reach 48.36 and turned down from there. Downwards movement was expected to continue, but this is not what is happening. I have two wave counts for you today that expect the same direction for the short term. 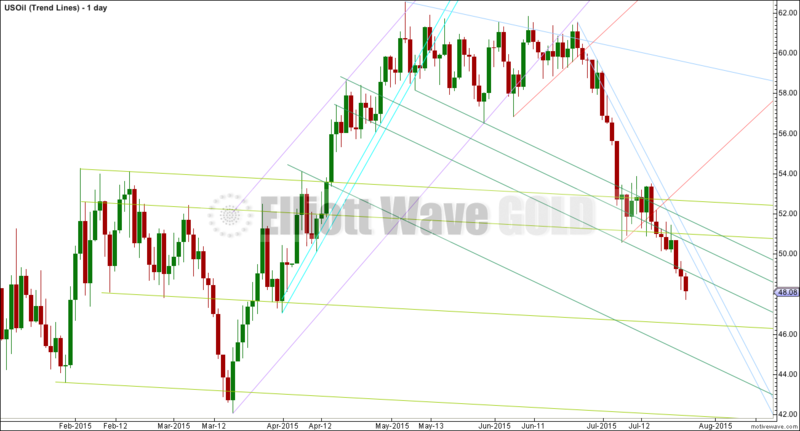 The session for 21st October provided confirmation of a trend change when it clearly breached the channel. 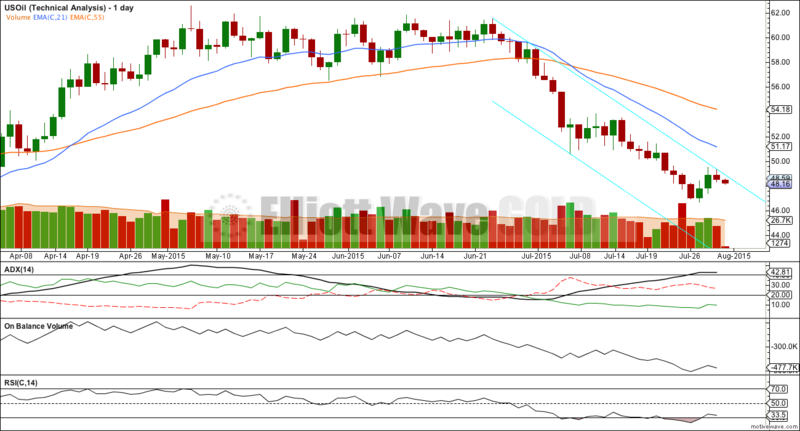 Downwards movement for the week was expected for US Oil. Upwards movement to a target at 51.14 to 51.2 was expected. Price moved higher and so far has turned at 50.93 just short of the target zone. The triangle completed sideways and was followed by upwards movement, as expected. The target is recalculated today. Upwards movement was expected for the last week but did not happen. Price has moved sideways, in a decreasing range, to continue a B wave triangle. The Elliott wave structure still looks incomplete. A target may now be calculated for the end of it. 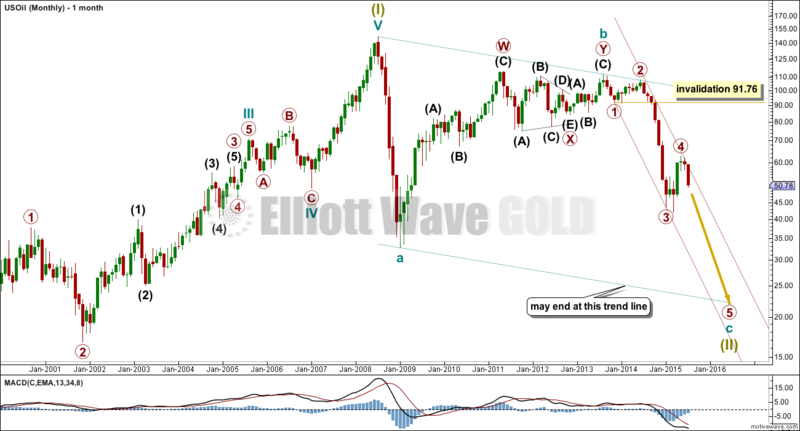 The Elliott wave structure looks incomplete. Price continues to move lower as expected. Summary: Fifth waves on commodities are often very swift and strong. The target for this one to end is at 21.96, and may be met in another six months time. Along the way down, corrections are very likely to find strong resistance at the upper edge of the channel. Changes and additions to last analysis are bold. This wave count sees US Oil as within a big super cycle wave (II) zigzag. Cycle wave c is highly likely to move at least slightly below the end of cycle wave a at 32.70 to avoid a truncation. Cycle wave c may end when price touches the lower edge of the big teal channel about this zigzag. Within cycle wave c, primary wave 5 is expected to be extended which is common for commodities. Within primary wave 5, no second wave correction may move beyond its start above 62.58. Draw a channel about this unfolding impulse downwards. Draw the first trend line from the lows labelled primary waves 1 and 3 then place a parallel copy on the end of primary wave 2. At the monthly chart level, this channel should provide resistance. Primary wave 5 may possibly be strong enough to overshoot the lower edge of the channel, but if it does that it should find some support there first. I am removing targets for intermediate wave (1); I will not calculate any again because I don’t think they’re going to be very useful. The last wave down at primary degree for US Oil moved lower with little interruption to the trend for the entire seven months, or 162 trading days. 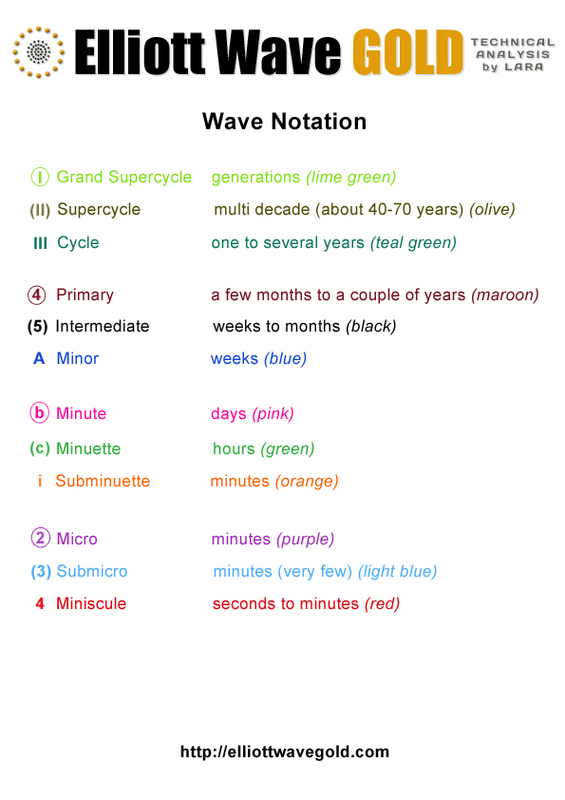 Within primary wave 3, intermediate wave (1) lasted only four days and intermediate wave (4) (a more time consuming shallow triangle) lasted only six days. Neither of these corrections moved price above the downwards sloping channel. The channel about primary wave 3 was breached to the downside, not the upside. So providing targets for intermediate wave (1) may give a false illusion of an expectation of a big correction for intermediate wave (2) which may never come, or may have already come and gone. Along the way down, the analysis of the waves within primary wave 5 may change as more structure unfolds. The bright aqua blue channel is a best fit, drawn in the same way on both this daily chart and the technical analysis chart below. Draw the first trend line (on a semi log scale) from the two highs as labelled, then place a parallel copy on the low of minor wave 3 to contain all this movement. 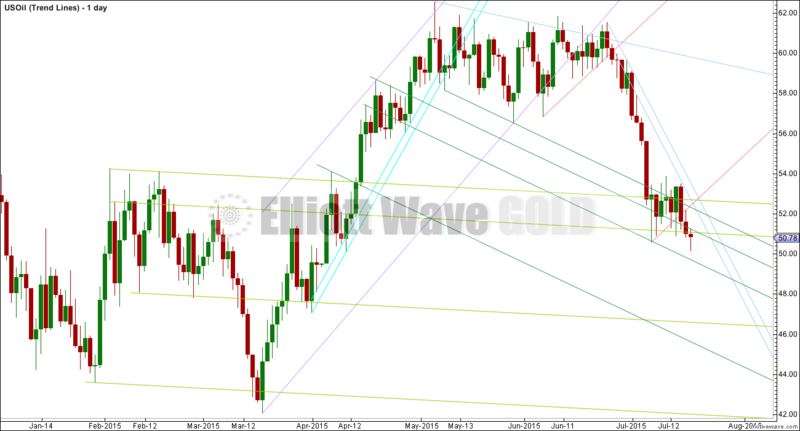 Upwards corrections are very likely to find resistance at the upper edge of the channel. The lower edge of the channel may be breached, and if it is, then expect momentum to continue to increase downwards. Primary wave 5 is likely to be stronger in downwards momentum than primary wave 3 was. So far it has not shown an increase beyond that seen for primary wave 3 (off to the left of the chart now), and so a further increase in downwards momentum is expected. At 22.21 primary wave 5 would reach 0.618 the length of primary wave 3. ADX is again clear; there is a trend, which is down and strengthening. To see what we may expect for primary wave 5, we may look at US Oil behaviour for primary wave 3. That began on 13th June, 2014, and ended on 28th January, 2015. 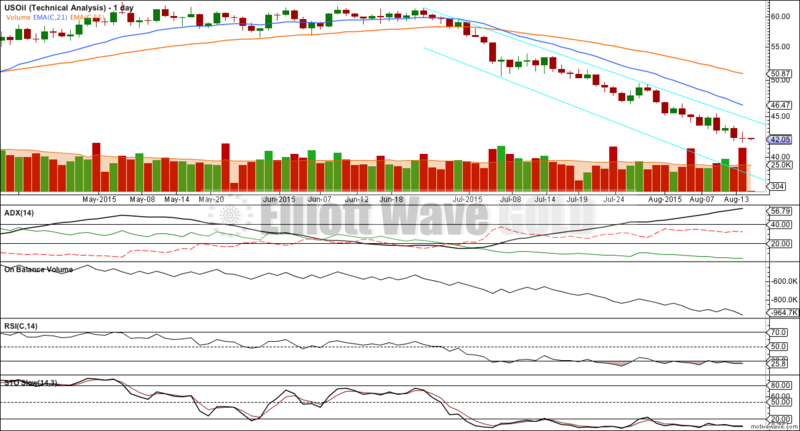 ADX reached to over 70 during primary wave 3. RSI first reached oversold on 19th August, 2014, then dipped below oversold twice again, and the last time to remain oversold was from 27th November, 2014, to 15th January, 2015. At the end of primary wave 3, there was strong persistent divergence between RSI and price. On Balance Volume showed single divergence only right at the end of primary wave 3 in the final four days. So far within primary wave 5, ADX is over 55. There is still room for this trend to continue to strengthen. 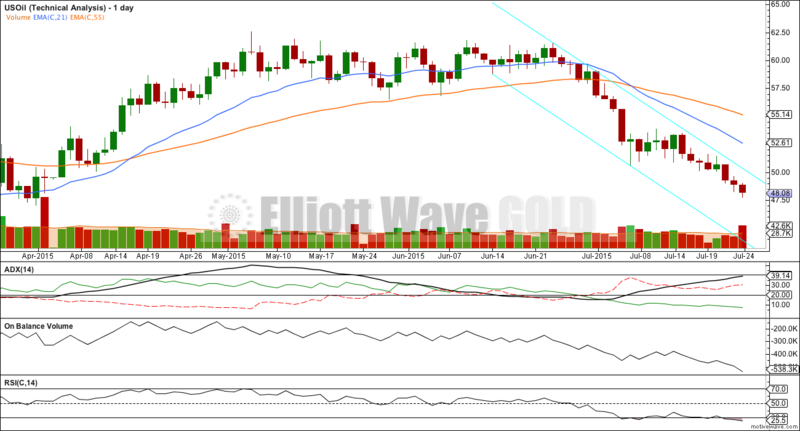 RSI is beginning to show oversold. This can be sustained by US Oil for long periods of time. However, in the last six days there is some positive divergence between RSI and price; while price has been moving lower RSI has been moving higher. This indicates a small correction against the trend may be due to unfold. This positive divergence can be seen back within primary wave 3 also. There it was resolved by short corrections against the trend to bring RSI back into normal. The trend then resumed. There is no divergence between price and On Balance Volume. While price moves lower, OBV also moves lower. OBV is not indicating an end to this downwards trend yet. The strongest and simplest piece of technical analysis on both daily charts is the bright aqua blue trend channel. Only if the upper edge of the channel is breached would the downwards trend possibly be over. While price continues to find resistance at that trend line the downwards trend should be assumed to be intact. Volume has increased for the last two downwards days. This fall in price is supported by volume. The trend is your friend. The use of stops is still essential, and good money management is still required to avoid wiping out your account. Although a trending market is easier to make profits in than a range bound market, it is still possible to have a loss while trading with the trend (because price does not move in a straight line). It must be accepted that losses are possible, so management of risk is essential to ensure they are not too many or too great. 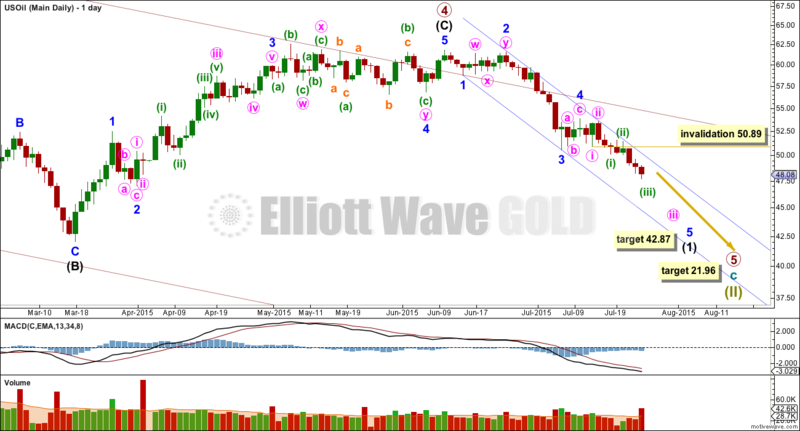 Stops may be set using Elliott wave invalidation points; they may be set a little above the trend line of resistance (small overshoots are acceptable); or they may be set at the last swing high. Trading against the trend or trying to pick a low is strongly not recommended. This analysis will only now be updated if the upper trend line showing resistance is clearly breached by a full daily candlestick above and not touching the upper trend line. This analysis is published about 01:48 a.m. EST. Summary: Fifth waves on commodities are often very swift and strong. The target for this one to end is at 21.96 and may be met in another six months time. A shorter term target for an interruption to the downwards trend is recalculated at 42.87. Primary wave 4 may not move into primary wave 1 price territory above 91.76. Draw a channel about this unfolding impulse downwards. Draw the first trend line from the lows labelled primary waves 1 and 3 then place a parallel copy on the end of primary wave 2. Copy this maroon trend line carefully over to the daily chart. A first wave down is still incomplete. There is no Fibonacci ratio between minor waves 1 and 3. This means there is very likely to be a Fibonacci ratio between minor wave 5 and either of 1 or 3. At 42.87 minor wave 5 would reach equality in length with minor wave 1. Minor wave 5 may end in another eleven days if it lasts a total Fibonacci twenty one days / sessions. Draw a channel about intermediate wave (1) using Elliott’s first technique: draw the first trend line from the ends of minor waves 1 to 3 then place a parallel copy on the end of minor wave 2. This channel is no longer a perfect fit. 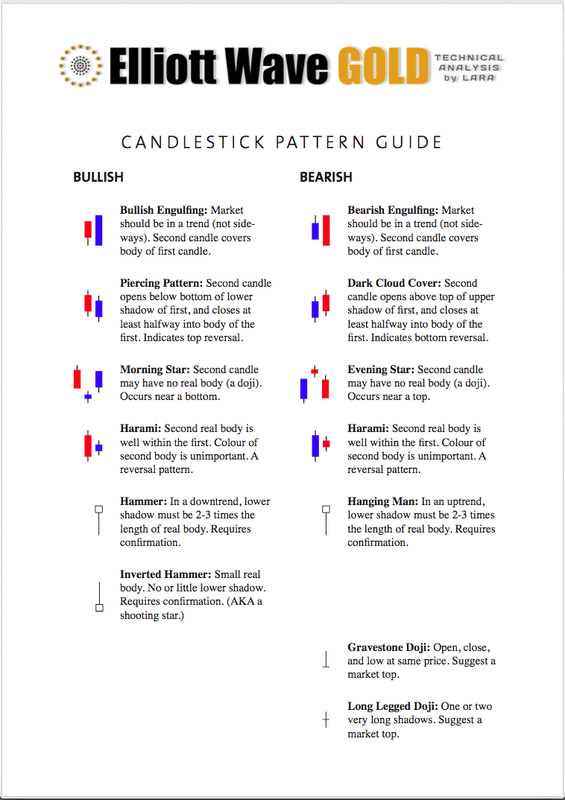 It is now breached by two daily candlesticks, but it was not breached with upwards movement and so the breach may not be an indicator that intermediate wave (1) is over. Minor wave 5 may be a typically swift strong fifth wave (it does not have to be, but this is a tendency of commodities so look out for it). If that happens, then the lower edge of the channel may not provide support. If price breaks below the lower edge of the channel, then downwards momentum may increase substantially. Within minor wave 5, minuette wave iv may not move into minuette wave i price territory above 50.14. I have looked to see if the structure for intermediate wave (1) could be complete, and the final fifth wave looks like it still needs to move lower. I do not think downwards movement will be interrupted yet by a larger correction. ADX is no longer as clear; it is flattening off. 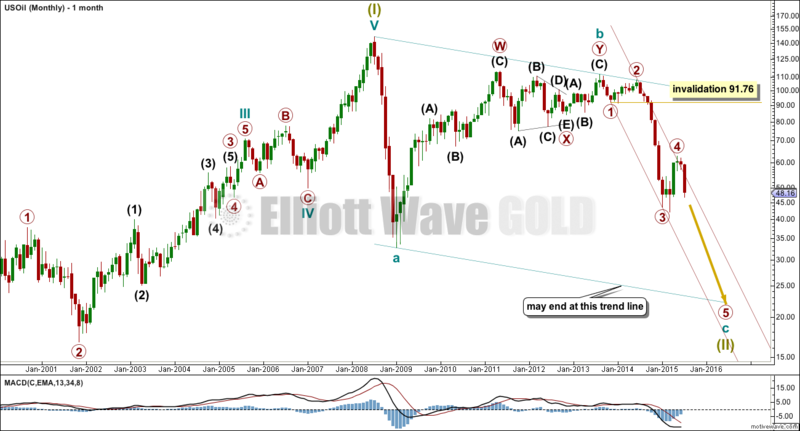 If it turns back up in the next one or two days, then I would have more confidence in the Elliott wave count. The bright aqua blue trend channel may be a better fit for this downwards movement now than the Elliott channel. The upper trend line especially so. There is a slight cause for concern that the two upwards days of the most recent correction came with rising volume; if this was a correction it may be expected to more likely come with falling volume. That rise in price was supported by volume and may be an indicator that a larger upwards movement could unfold from here. This is in opposition to the Elliott wave count. With RSI and Stochastics both now returning from oversold, there is again room for price to fall. To have more confidence in a downwards trend, I would want to see a downwards day with stronger volume than the prior two upwards days and ADX to turn up again. This analysis is published about 04:50 a.m. EST. Primary wave 5 is still in its early stages. 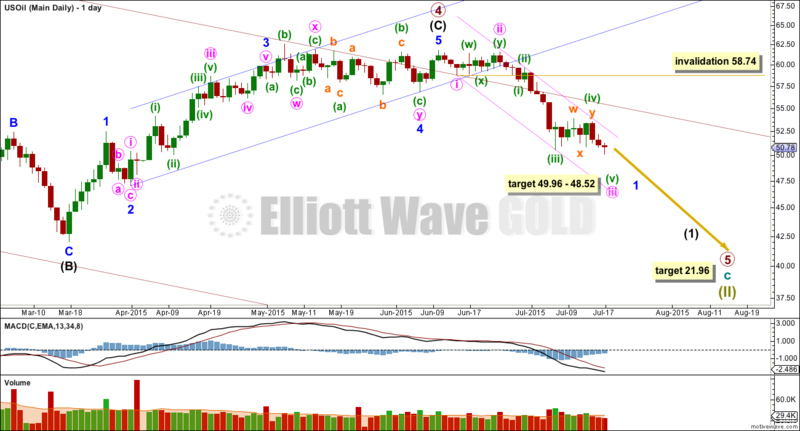 The Elliott wave count is adjusted and the target is recalculated. A first wave down is still incomplete. I am moving the degree of labelling within it up one and moving the third and fourth wave lower. There is no Fibonacci ratio between minor waves 1 and 3. This means there is very likely to be a Fibonacci ratio between minor wave 5 and either of 1 or 3. At 42.87 minor wave 5 would reach equality in length with minor wave 1. Minor wave 5 may end in another eleven days if it lasts a total Fibonacci twenty one days / sessions. Draw a channel about intermediate wave (1) using Elliott’s first technique: draw the first trend line from the ends of minor waves 1 to 3 then place a parallel copy on the end of minor wave 2. This channel is a perfect fit. Only when price clearly breaches the upper edge of the channel with a full daily candlestick will I expect that intermediate wave (1) is over. While price remains within the channel expect the downwards trend to continue and upwards corrections to find resistance at the upper edge of the channel. Within minor wave 5, minute wave iv to come may not move into minute wave i price territory above 50.89. ADX is still clear. The ADX line is above 20 and rising indicating a trend which is strengthening. The -DX line (red dashed) is above the +DX line (green solid) indicating the trend is down. When a market is trending, then a trend following system should be used for trading. The simplest trend following system uses lines of support and resistance. For a downwards trend, upwards movement may be expected to be corrections against the trend and should end when price finds resistance. As each short term high is made it should not be exceeded again for some time. A trend should be assumed to continue while ADX continues to rise and price remains below resistance. For the last three days, volume is overall increasing while price has fallen. The fall in price is now supported by volume. On Balance Volume now agrees with price; as price falls OBV trends lower. The shorter EMA is below the longer EMA, indicating the trend is down. 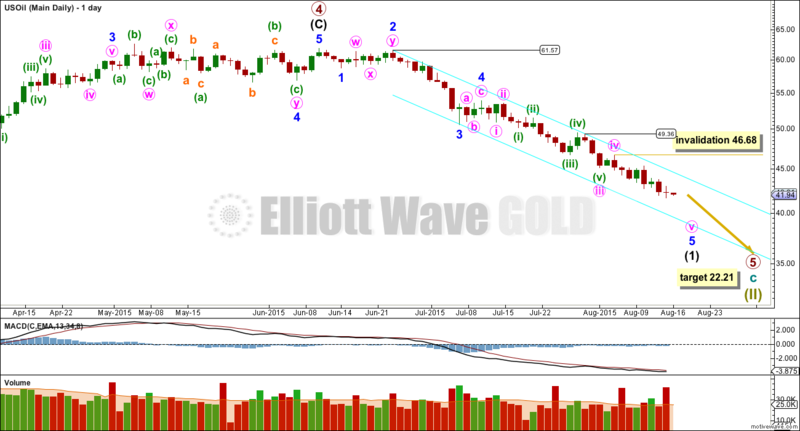 This regular technical analysis agrees with the Elliott wave count. RSI is showing slightly oversold, but there is no divergence with price and RSI is not oversold yet at the weekly chart level. Only when there is clear divergence with price and RSI, then at the daily and weekly chart level would I expect a larger interruption to the downwards trend. For US Oil RSI can remain below 30 for reasonable periods of time before a low is found. I use parallel trend lines to indicate potential areas of support and resistance. This analysis is published about 05:30 a.m. EST. Primary wave 5 is in its early stages. Summary: Fifth waves on commodities are often very swift and strong. The target for this one to end is at 21.96 and may be met in another six months time. A shorter term target for an interruption to the downward trend is at 49.96 – 48.52 which may be met in four days time. Draw a channel about this unfolding impulse downwards. Draw the first trend line from the lows labelled primary waves 1 and 3 then push up a parallel copy to contain all of primary wave 2. Copy this maroon trend line carefully over to the daily chart. Primary wave 4 is very likely to now be complete. The channel about intermediate wave (C) is comfortably breached. Within the new downward trend, a first wave is an incomplete impulse and this is most likely minor wave 1. Within minute wave iii, minuette wave (iii) is 0.17 short of 2.618 the length of minuette wave (i), minuette wave (ii) was a shallow 0.47 zigzag, and minuette wave (iv) exhibits good alternation as a more shallow 0.32 double combination. At 49.96 minuette wave (v) would reach equality in length with minuette wave (i). At 48.52 minute wave iii would reach 4.236 the length of minute wave i. This gives a 1.44 target zone for the end of minute wave iii. Minute wave iv to follow may be expected to be a very shallow zigzag, zigzag multiple or triangle to exhibit alternation with the deep combination of minute wave ii. Minute wave iv to come may not move into minute wave i price territory above 58.74. The trend channel drawn about minor wave 1 down is a best fit. The upper edge may be where minute wave iv finds resistance. ADX is now very clear. The ADX line is above 20 and rising indicating a trend which is strengthening. The -DX line (red dashed) is above the +DX line (green solid) indicating the trend is down. The market has been falling of its own weight; not all falls in price have been supported by an increase in volume. This is okay, price can fall due to an absence of buyers and so may fall on light volume. At the end of each fall over the last seventeen days volume increased on the last day down. This pattern may repeat. As at the end of this week there was no increase in volume, so it may be quite likely that next week price will continue to fall. 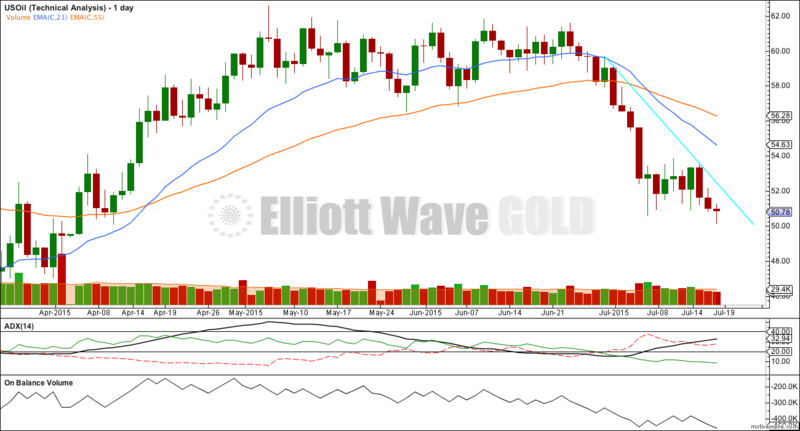 Look out for a down day which shows an increase in volume to indicate a potential short term low. On Balance Volume very slightly agrees with price; as price falls OBV trends lower. The last low in price to end the week corresponds with a very slight new low on OBV. The two aqua blue lines are drawn using Magee’s approach as outlined in the classic “Technical Analysis of Stock Trends”. These were both breached on 15th May indicating a trend change. Since the breach price has moved lower. The other trend lines are my own. I use this approach to indicate potential areas of support and resistance. This analysis is published about 12:34 a.m. EST.